This apple cider vinegar recipe is a delicious salad dressing for Mexican food. On a green salad, it seems to compliment extremely well with refried beans, spanish rice, enchiladas and especially tostadas. 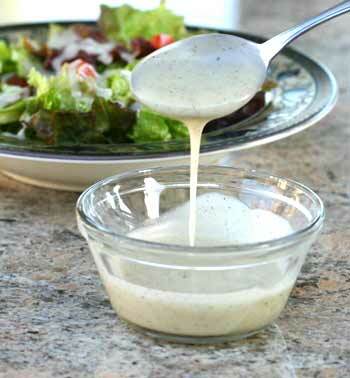 And did you know that this dressing is made creamy and thick with a spice? Keep reading and I’ll tell you what it is. You’ve gotta try this homemade vinaigrette at least once, especially when you make Mexican food. The dressing compliments these flavors so beautifully that in the restaurant business we used to serve our salads right on the plate with the main meal. I still do it this way when we go out for Mexican food. I can be found dumping my apple cider vinegar salad right on top of my beans, rice and enchilada. And who would of thought that the garlic powder would give this dressing it’s creamy texture? It’s really amazing. This keeps the calories lower because you don’t have to add mayonnaise, sour cream or yogurt to make it creamy. So make sure and use the garlic powder that has the consistency of flour. It’s not granulated at all. Add all ingredients to a blender and blend for 20 seconds or until well blended. It would be best to pour the dressing into a bottle that has a top you can shake the dressing out of instead of pouring it. What I like to do is save old dressing bottles that have a shaker top. This makes applying the dressing easier. I dislike bottles where the dressing pours out and you end up with a puddle of it on your plate. The shaker method will distribute your dressing lightly and with better control. Store the dressing in the refrigerator and it will keep for several weeks. You can even use it to marinade chicken and fish. The apple cider gives it a nice tangy taste. Don’t forget to try this apple cider vinegar dressing with your next Mexican dinner. It’s a must for the Mexican salad recipe. Watch this video to see how our creamy Italian dressing is made. Return from Apple Cider Vinegar Recipe to More Mexican Food Recipes.